« Tap Forms Featured on the iTunes App Store! 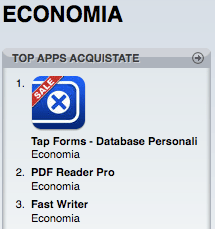 Tap Forms reaches #1 in Business in the UK and Italy! I just checked the App Store in the UK and Italy and saw that Tap Forms has now reached the #1 spot in the Business category there! It also made it into the Top 100 overall on the UK, Italy, and Netherland stores! A little more to go and maybe it'll make it to the Top 50 overall! Or even higher! Ok USA, Canada, Japan, Netherlands and everywhere else, lets see if we can get this iPhone database app to the top spot in Business in all the countries of the world! This entry was posted on Friday, February 27th, 2009 at 7:39 PM	and is filed under Uncategorized. You can follow any responses to this entry through the RSS 2.0 feed. You can leave a response, or trackback from your own site. I’m the editor of iltuoiphone.it website and I would like to make an Italian review of your software.